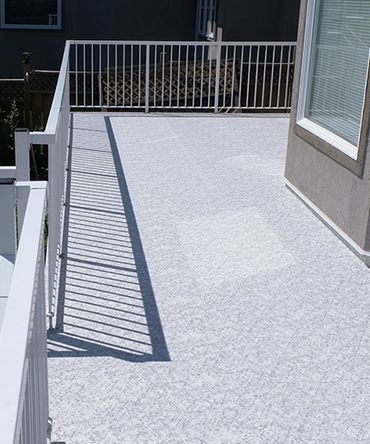 The lightly dappled look of Sanibel Marble waterproof vinyl decking by Tufdek™ offers the look of rock, without the hassles of cleaning and maintenance required of a rock surface. On your sundeck, roof deck, patio or balcony, Sanibel Marble decking will blend well with any color of home siding, railing, or fencing. You can accent your deck or patio with blue, red, or green plants and accessories to complete the look, or pick up an outdoor area rug to tie together larger spaces. Sanibel Marble is also a great alternative to concrete pool surrounds, as it not only looks great and is easily installed, but also uses proprietary Aqueous based inks with revolutionary Polycarbonate top finish. Our technology ensures that this waterproof decking can withstand the rigors of active families. As with all Tufdek™ products, you’ll find a fabulous blend of durability and affordability, all wrapped up in a PVC waterproof membrane that seals watertight against the elements. Choosing a great waterproof vinyl decking product is no small task, but with Sanibel Marble vinyl deck flooring you’ll end up with a beautiful deck or patio surface that looks great, requires low maintenance, protects against the elements, and will stand up to the test of time. 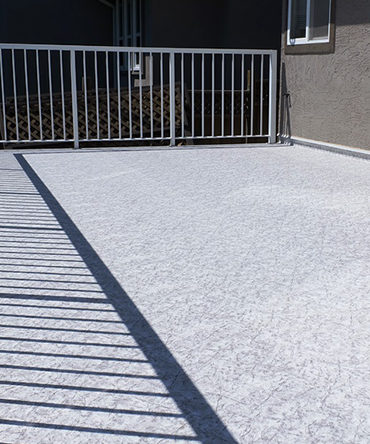 Sanibel Marble vinyl decking also features highly reflective Cool Step deck flooring design elements to help keep your deck surface cool. Just imagine how great your outdoor space could look after installing Sanibel Marble vinyl flooring for decks or any other Tufdek™ vinyl decking product – it could completely change the look of your yard space with a minimal investment. 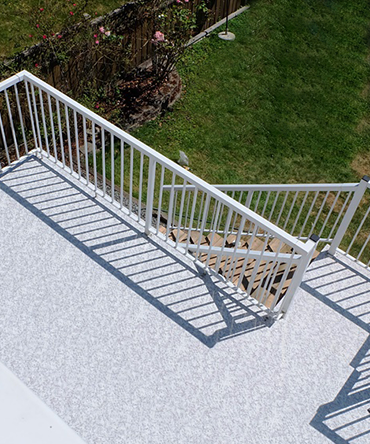 Find out more about Tufdek Sanibel Marble waterproof vinyl decking by Tuff Industries. Call our vinyl decking experts toll free at 1-877-860-9333 or send us an email. Tufdek™ Supreme Sanibel Marble Vinyl Flooring is only available through "Authorized Dealers". Tufdek™ Supreme Sanibel Marble Vinyl Flooring is assembled by one of North America’s leading PVC roof membrane manufacturers and quality audited by Intertek, an independent third party testing facility.